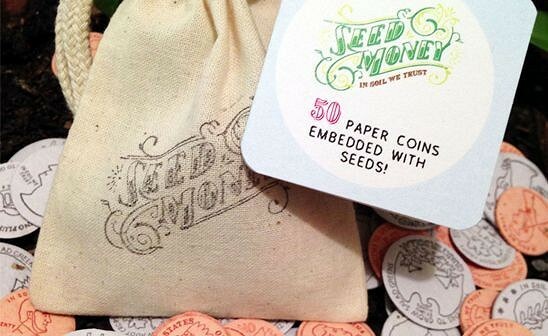 Spread a little happiness with Seed Money, a set of plantable paper coins that look like real pennies, nickels, dimes, and quarters. Family and friends will love planting these fun little gifts and watching as colorful flowers and delicious vegetables sprout in their place. Leafcutter Designs, founded by artist Lea Redmond and her brother Devin, seeks to create thoughtful goods that inspire creativity and promote a more playful and peaceful world. Using eco-friendly materials, Lea hand illustrates and letterpress prints each coin on thick, custom papers embedded with seeds. Each coin corresponds with a different set of seeds. Pennies contain a mix of wildflower seeds, nickels with herbs, dimes with carrot and turnip seeds, and quarters with salad greens. Each sack comes with a mix of 50 coins: 20 pennies, 10 nickels, 10 dimes, and 10 quarters, along with planting instructions. Whether you’re an adult or child, you’ll love surprising friends and family with a thoughtful gift that can easily slide into a purse or pocket. For the extra mischievous, leave a friendly gift for strangers by “dropping” a coin on the sidewalk or planting them in a friend’s front yard. Put a smile on someone’s face with a piece of Seed Money; who knows, you might just turn his or her bad day into a fabulous one. Spread a little happiness with Seed Money, a set of plantable paper coins that look like real pennies, nickels, dimes, and quarters. Family and friends will love planting these fun little gifts and watching as colorful flowers and delicious vegetables sprout in their place. Leafcutter Designs, founded by artist Lea Redmond and her brother Devin, seeks to create thoughtful goods that inspire creativity and promote a more playful and peaceful world. Using eco-friendly materials, Lea hand illustrates and letterpress prints each coin on thick, custom papers embedded with seeds. Each coin corresponds with a different set of seeds. Pennies contain a mix of wildflower seeds, nickels with herbs, dimes with carrot and turnip seeds, and quarters with salad greens. Each sack comes with a mix of 50 coins: 20 pennies, 10 nickels, 10 dimes, and 10 quarters, along with planting instructions.